Before: Jen as an aspiring home stager in grade one. 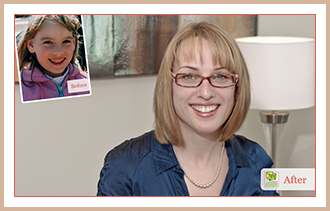 After: In her early 30s, Jen is just shy of the average first time home buyer (32) and loves staging properties to them. At 16, I learned how appearance and condition affect the value of an item for sale. I purchased my first car (a red Toyota Tercel) for $2,000, cleaned it up, replaced the windshield, battery and stereo and sold it a year later for $2,500. Pretty good for an investment that depreciates in value. In 2006, my brother and I purchased our first “fixer-upper” and transformed it into a dream home during our spare time. For anyone who has or is going through renovations, I know what you are going through. It isn’t easy, but the short term pain will be worth it. During my first career in the design industry, I created marketing materials that were visually appealed to customers. Although the industry was creative and exciting, my heart longed for more. With my professional design and personal renovation experience, I decided to take a risk and make home staging my career. Successfully completing two home staging courses (the Canadian Staging Professionals’s course and QC Design School’s International Staging & Redesign Professional) gave me the knowledge and skills necessary to start my own home staging company. Not only do I to help home owners showcase show-able, sale-able and stunning listings, but I taught Realtors “The Basics of Home Staging” at CREB (Calgary Real Estate Board). If you would like to meet me in person, please contact me. I’d love to meet you!